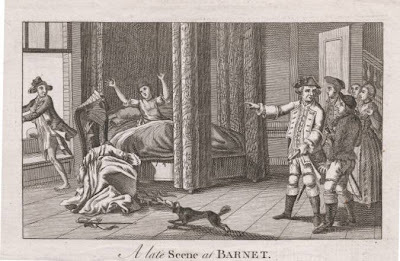 This print entitled " A Late Scene at Barnet" c 1770, has the typical lover jumping out the window upon discovery. Unknown to this blogger is the significance of the word "Barnet". It could be a manor, town or even be referring to a person but it has some meaning to the 18th century public purchasing this print and could even be a political statement of some sort. Of interest is the set of stays tossed off to the side of the bed on top of the chair. These stays have the decorative cording often seen on stomachers and shoulder straps. Barnet is a town in Hertfordshire, England - not far away from London. Interesting how, even in the middle of ... that, the man still has his coat on!